Hopefully, with these tips, you won’t have to go through the same experience. In order to make the best of the situation, you need to create a strategy. Do it now while you have time. Don’t wait until the last minute and try to wing it on the spot. If things don’t go well, you’ll only make it worse. If you’re invited to a social event, find out who will be there. If your nosy mother-in-law or insensitive aunt are among the invited guests, limit your time there or skip it completely. If you decide to go, arrive late, leave early, and stay close to your partner or people you feel comfortable with. That way you won’t have to worry about getting cornered by someone you don’t want to talk to and answer questions you don’t want to be asked. Before you head out the door, put together a list of answers. Go over them in your head or with your partner until they become second nature. The more you practise, the easier it will get. If you’re going out to a party with strangers, keep in mind that most people you will meet won’t have the faintest idea about what you’ve been through or that you’re trying to adopt. When they ask you THE question, or a variation of it (“You guys have kids?” “You thinking of having kids?” “You trying to have kids” “When are you going to have kids?”) they’re not doing it maliciously. They’re just trying to make conversation. So be prepared to cut them some slack. How you respond to THE question is up to you. I tend to give people the benefit of the doubt and take a more restrained approach. But if that doesn’t work for you, try something that does. The important thing is to set boundaries. Decide who to tell and what to say. For instance, to someone you don’t know, you might want to respond with something short and simple like “We don’t have kids but we’re hoping to have some in the future” or “None yet, but we’re working on it” and leave it at that. Usually it does the trick. The person will get the hint and cast around for something else to talk about. But what happens if he keeps drilling away or, worse, offers you unsolicited advice about how to get pregnant? When we were adopting, that happened to us all the time. The moment we mentioned we didn’t have children, people saw it as opportunity to jump in and share their two cents. At this point, you can smile and say “Thanks,” and let it go or, if things get awkward, you can try other tactics. You can ignore them. You can change the subject (“Can you believe the weather we’ve been having!”). You can tell them it’s a private matter and that you don’t feel like getting into it. Or you can excuse yourself and make your way to the bar or to someone you really want to talk to. Most people mean well, even if their advice is misplaced. It’s hard to listen to someone tell you how to get pregnant when you’re long past that stage and on a waiting list to adopt. But even though you’ve decided that adoption is the right path for you, you may not be ready to talk about it. Maybe you want to keep it private. Maybe you fear you’ll be judged. Or maybe you’re worried that others won’t understand and that you’ll just open yourself up to more hurt and frustration. In the end, you have to do what you have to do. That said, there are all kinds of benefits to going public with your plan to adopt instead of keeping it secret. People keep secrets about things that are shameful. But adopting a child isn’t anything you should ever feel ashamed of. Talking about it can help you normalize feelings about your plan and make you feel less isolated — especially if the other person has an adoption connection. Plus, you never know: He might know expectant parents who are considering adoption and put you in touch with them. Many waiting parents complain about being frustrated that other people don’t understand what they’re going through. But how can they know if you keep it yourself? Sharing your adoption plan can solve the problem and it can be a great opportunity to educate others. Many waiting parents have found that talking about adopting helped them to visualize themselves as adoptive parents and brought them emotionally closer to their child. But be careful: it can also open up a can of words and lead to even more annoying questions such as “how much does it cost” and “what if the birthmother changes her mind”? When that happens, all you can do is be patient and explain your situation as best you can. Most people have a limited, if not distorted, understanding of adoption so don’t take it personally. One response that many waiting parents swear by is to reply “Why do you ask? 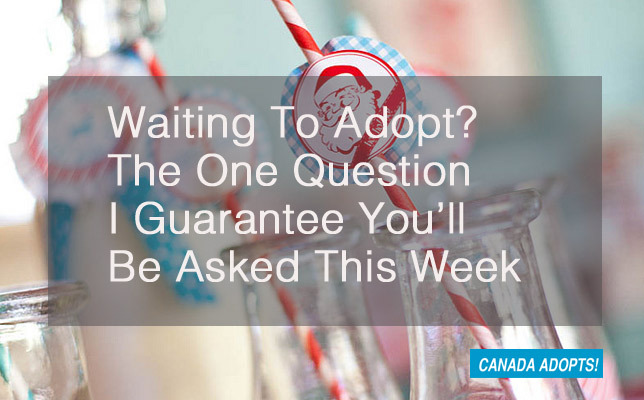 Are you thinking of adopting too?” By throwing the question back at them, you move the discussion back into their court and that usually stops them in their tracks. To re-cap, the holidays are a time that revolves around children. So don’t be surprised if someone asks you THE question about how many children you have in the days ahead. Yes, it’s annoying, but with a bit of planning and preparation you can take control of the situation and enjoy the holidays just as much as everyone else. What responses have worked for you? I’d love to hear your thoughts. Share them on our Facebook page and don’t forget to Like us and raise awareness about open adoption. Previous PostWhen The Holidays Arrive, But The Baby Doesn’t: Tips For Waiting ParentsNext PostWhat’s The Best Gift You Can Give A Birthmother?